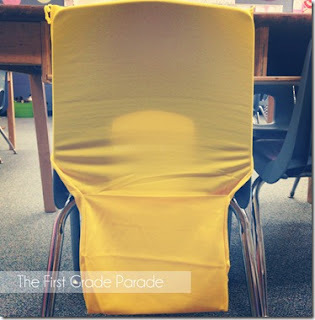 Starring in First Grade: First week of School and Monday Made it! I have been completey MIA as I have been preparing for and survivning the first week of school! I have a wonderful group of students and I am so excited about this school year! I have so much to share I dont really know where to begin! 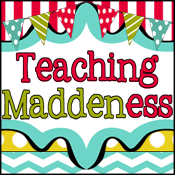 I do want to say Happy Late Birthday to Amanda at Teaching Maddeness! She has been so encouraging since I started blogging and last year when I was developing a theme I used several ideas from her former classroom theme! She has so many wonderful ideas so please check out her blog! For Open House I put up a photo booth ( that I purchased from wal-mart in the party section) outside my classroom for parents to take picture at their leisure! It has also served a great back drop for First Day of First Gade Pictures and the students loved the props for silly pics! I gave the students smarties as a little gift for open house and put together a goody bag for the first day of school! Both bag toppers came from Cara Carroll's Saved by the Bell Packet from Teacher Pay Teachers. 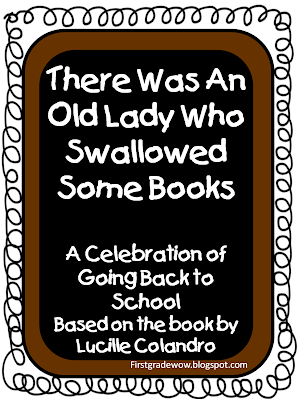 We read There was an Oldy Lady Who Swallowed Some Books and completed a mini unit from First Grade Wow! 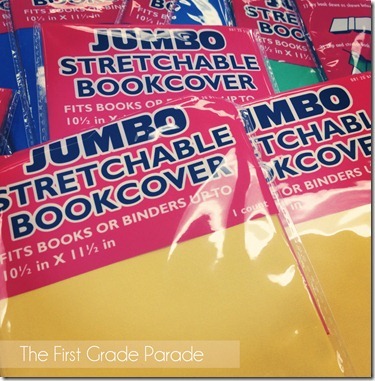 Click the picture below for this great back to school unit! I reinforned school rules by reading David Goes to School and discussed Peacemaker and Peacebreakers from Cara Carrols First Grade Parade Peace Makers lesson. The students created their own David and wrote a rule they learned on speech bubbles and this was a huge hit! I will have to post a pick of their finished work later! Here are a few Monday Made it projects that I have completed over the last two weeks! I purchaces a large film strip from Party City and didnt know what I was going to use it for until I realized I didnt have a great place for a word wall! This project took some time but I am pleased with the outcome and I attached mini velcrom dots to the film strip so that I can be used again next year! This is a lunch choice board with a cookie sheet from the dollar store, duckt tape, ribbon, and mini magnest from target! I didnt have a great system for lunch choice so this is a great timer in the mornings! I will be featuring a star of the week and this is where I will display a picture of the little star! The hard hats will be for my boy and girl hard workers of the week! This is where I will disply student work on our LOOK WHAT WE DID bulletin board! I hot glued mini popcorn boxes to clothes pins which will be so much easier than trying to use a stapler each time! I am also using the book covers as pockets from my center charts that I have turned into word work stations! My first week of school ended with one of my students bringing me this adorable sign as a back to school gift! It's going to be a great year!! Looking good! Here's to a great school year. Your classroom looks wonderful. I like your popcorn boxes on your bulletin board. I'd also like to invite you to my linky called "Fun Friday." It is all about the fun things we do in our classrooms. I'd love for you to stop by and link up. I just love your popcorn bucket filler idea! SO CUTE! I am using the same containers from Target for my Daily 5 POPCORN game! PS~ You have an award waiting for you over at my blog! Stop by anytime!! !